For the Harry Potter fans, this recipe needs no explaining. For the rest of you, think of these as a butterscotch cream soda flavor (I know, who isn’t a Harry Potter fan?!)! It’s incredibly decadent but oh so delicious! I made these at my sister-in-law’s request, she’s both a Harry Potter fan and a big fan of my baking, too. These were an absolute hit at the party she served them and I am definitely excited to make them again. Obviously, this wasn’t a Harry Potter themed party, but these would be a perfect fit and there are tons of decorating ideas out there for Harry Potter (I like the golden snitch and the wands, personally). I’ve always loved butterscotch (am I the only one that craved those little golden yellow wrapped candies? ), but I’ve never had a baked treat that had so much butterscotch flavor. 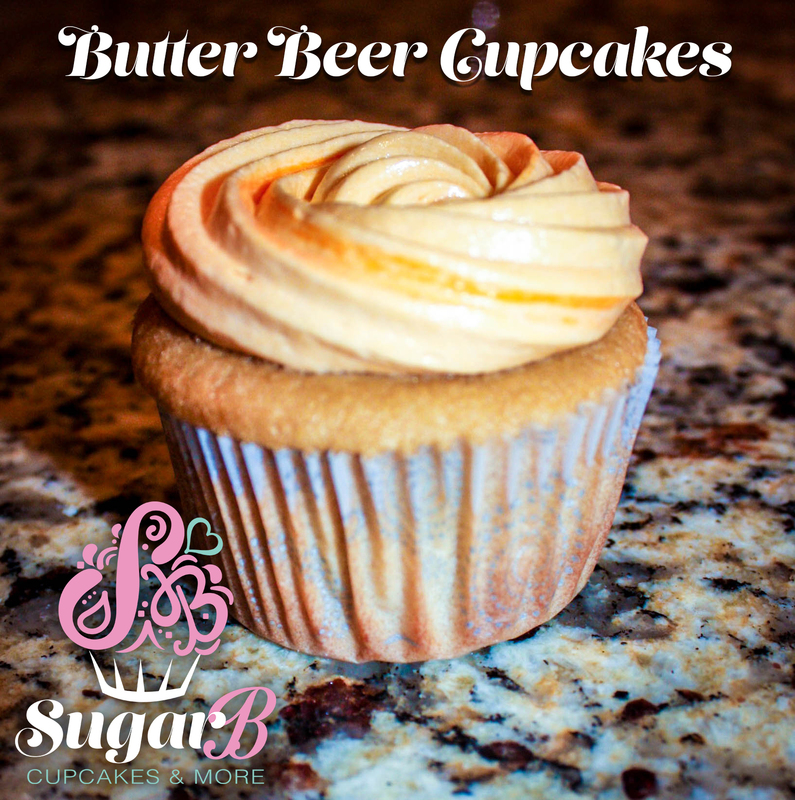 I haven’t been to Harry Potter World yet, but I will absolutely have to try the Butter Beer after making this delectable cupcake version. Preheat the oven to 350 degrees and line cupcake pans with paper liners. Combine your 2c flour, 1/2t baking soda, 1 1/2t baking powder, and 1/4t salt in a bowl and set aside. Sift the ingredients to avoid clumps. dark brown sugar then beat until well-combined. Beat in your 3 eggs, one at a time, mixing well after each addition. Then beat in your 1 1/2t vanilla and 1t butter flavoring. Alternate adding your 1/2c buttermilk, 1/2c cream soda, and dry ingredients in batches until all are well incorporated. 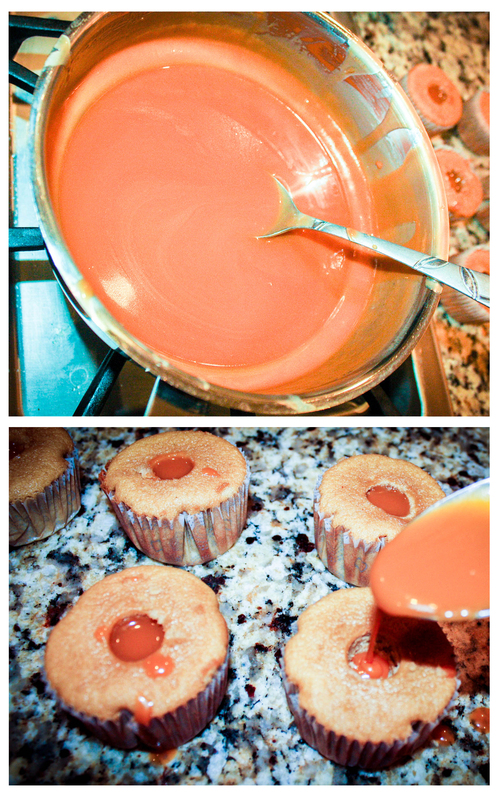 Fill each cupcake liner 2/3 full, bake for 15 to 17 minutes until a tester inserted into the center comes out clean. Cool completely on wire racks then freeze cupcakes by wrapping in seran wrap then foil for best results (if time allows). In a double boiler, combine 11oz butterscotch chips and 1c heavy cream and stir until completely combined and smooth. Fill a squeeze bottle with ganache and insert into the center of each cupcake, squeezing until filling begins to overflow. Cream 1/2c butter in a large bowl until fluffy. Add in 1/3c ganache, 1t vanilla, 1t butter flavoring, and 1/8t salt and mix until well combined. Beat in 16oz powdered sugar 1 cup at a time until reaching desired consistency. I always pulse the mixer a few times before allowing the mixer to incorporate to avoid the powdered sugar exploding. Add splash of heavy whipping cream by the tablespoon as needed. Frost cupcakes and enjoy! Consider topping with leftover ganache or butterscotch chips. These rich, butterscotch cupcakes will certainly make any occasion even better! Loving the idea of butterscotch ganache! I’ve made butterbeer and butterbeer ice cream, but I may have to try cupcakes next! I also have a hp fan sister, must try them for her!